The Hanging Gardens of Babylon. Artist rendition by Sergey Likhachev (Batkya). The ancient Babylonians, like the early Egyptians, built great stone structures using slave labor, but unlike their mortal enemies, they preferred to immediately reside in their monoliths rather than wait until the afterlife. Today, their crowning achievement, the royal palace of King Nebuchadnezzar II and its famed Hanging Gardens, is called one of the Seven Wonders of the Ancient World, but when first constructed, this edifice was an uncomfortable island of stone that marooned its royal inhabitants from nature. Amytis, the king’s wife, became homesick for the lush greenery of her home in the ancient kingdom of Media. “Fix it,” ordered King Nebuchadnezzar, and his engineers devoted much thought to ways of raising water to impossible heights for the installation of gardens. Historians are not sure how they accomplished this task because no archaeological evidence exists, but they agree that it was most likely a gear and screw apparatus not unlike the one illustrated by and named after the Greek mathematician Archimedes. To keep soil from eroding off the structures, Babylonian engineers employed stone boxes, a concept in use for centuries that in now called raised bed gardening. 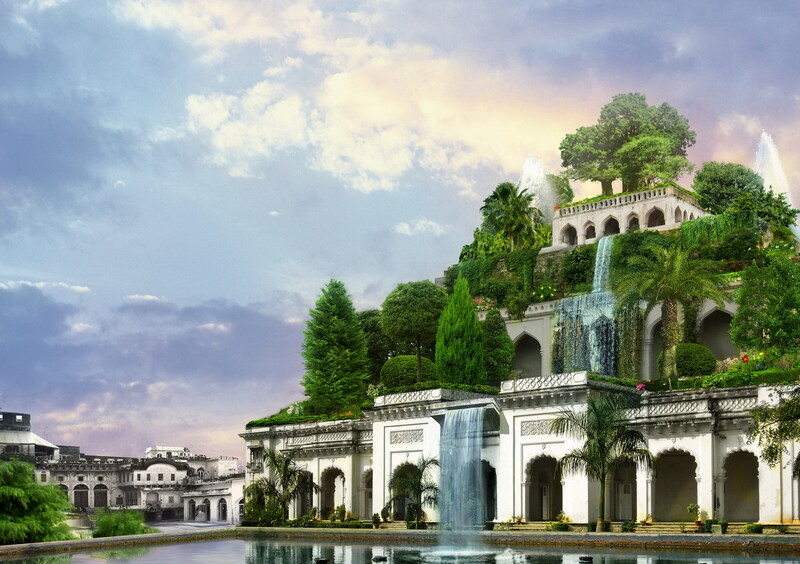 Although modern-day renderings of the Hanging Gardens portray them as a pleasure garden, it is more likely they were intensively planted food factories providing palace inhabitants with a bountiful supply of fresh produce and food security. The early Romans took to intensive agriculture in a big way because they had hungry and restless armies to feed. They piped water, moved and amended soil, developed new pesticides and provided slaves with bamboo poles to deter crop predation by birds, especially in the vineyards. A day without wine was a day without sunshine for the Romans, and wine was best enjoyed with bread dipped in olive oil or fish sauce, with a side of millet gruel, stewed lovage and a bit of fish or fowl. The privileged classes of Rome fared well, as their large villas in the paved-over metropolis of Rome provided them space for rooftop and courtyard gardens, an emulation of the Babylonian hanging box gardens. Readers lucky enough to have visited a traditional Italian home with a vine-draped patio can easily visualize those early courtyards and rooftop gardens that employed ancient intensive gardening methods. And small-space gardeners who routinely use raised beds, containers, square-foot plots and vertical planting to maximize healthy yields in a limited area can thank the Babylonians for their groundbreaking use of techniques that gave birth to them all. This entry was posted in Garden, Gardening, History and tagged Babylon, garden, garden history, gardening, Hanging Gardens, Hanging Gardens of Babylon, intensive gardening, Nebuchadnezzar. Bookmark the permalink. The two are not exclusive to each other. We do have documented evidence that the gardens throughout medieval Europe and into the Victorian age were designed to be both functional and ornamental. In the Roman era, there is much poetry about the beauty of olive trees, so they likely also did not suffer from the modern aesthetic that edible = ugly.